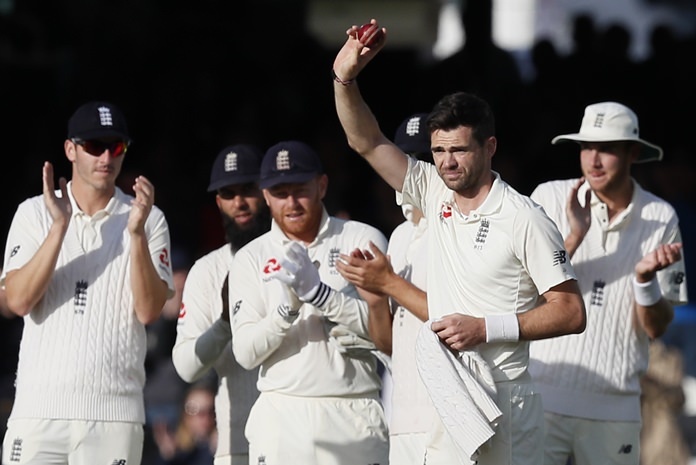 London (AP) — Only Ben Stokes defied the conditions as wickets continued to tumble in the final test between England and West Indies on Friday — two of them to James Anderson to see him become just the sixth bowler to pass 500 test wickets. West Indies emerged with a 22-run lead after a rain-affected day which kept conditions ideal for the quick bowlers at Lord’s. The tourists only had seven wickets left in their second innings after reaching 93-3 at stumps. Nine wickets fell on Friday after 14 went down on the first day on Thursday and a result appears inevitable in the series-decider. Either England will seal a second straight series win of the summer to set them up for their next contest, the Ashes in Australia at the end of the year. Or West Indies will win their first series in England in nearly 30 years. The last time the West Indies won in England, the great Viv Richards was in the team. Shai Hope was 35 not out for West Indies at the close on Day 2, and key to the tourists’ hopes of building a significant enough lead give them a chance of victory. Roston Chase was 3 not out. Anderson went to 500 in his second over of West Indies’ second innings when he bowled Kraigg Brathwaite with a ball that seamed back into the right-hander and clattered into middle stump. It put Anderson alongside Muttiah Muralitharan, Shane Warne, Anil Kumble, Glenn McGrath and Courtney Walsh as the only bowlers to take 500 test wickets. Anderson is the first Englishman to reach the mark, and just the third quick bowler. Anderson followed up with an even better ball to remove Kieran Powell for 45, beating the opener to clip the bail off the off stump. Hope hit six fours, settling the West Indies after Anderson and Stuart Broad had threatened to run through them for a second time in the test. So far, only one batsman has come close to conquering the Lord’s pitch and the opposition fast bowlers, though. Earlier, Stokes followed up his 6-22 in West Indies’ first innings to hit 60 in England’s 194 all out. That was easily the best performance with the bat in the match and gave England a 71-run first-innings lead. Stokes’ score came off 74 balls with 10 fours, a rattling strike rate as he threw caution to the wind and helped England fight back after resuming on 46-4. West Indies could have kept the lead to much less, but allowed England to put together partnerships of 29 for the ninth wicket and, gratingly for the tourists, 31 for the last wicket. Broad made 38 from No. 10. Kemar Roach finished with 5-72 and captain Jason Holder 4-54 as West Indies needed just three bowlers to bowl out England.